The Grace College athletic department recently unveiled two newly installed windscreens at Miller Athletic Complex on Pierceton Road south of the main campus. 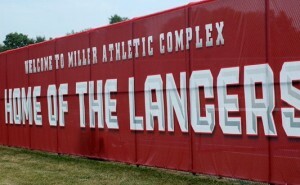 The red windscreens at the tennis courts at Grace’s Miller Field feature strong Lancer branding to enhance the experience for fans, athletes and visitors. 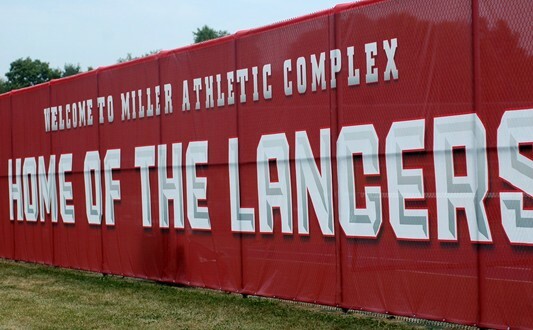 The red windscreens at the tennis courts and soccer field feature strong Lancer branding to enhance the experience for fans, athletes and visitors. The mesh windscreens will also greatly cut down on wind effects for tennis and soccer. Included on the new windscreens is added branding for the Crossroads League to help the league’s exposure at Grace athletic events. Check out the new windscreens on Saturday, September 14, at the cross country Lancer Invitational at 10 a.m. or at men’s soccer’s home match against Ohio Christian at 2 p.m.